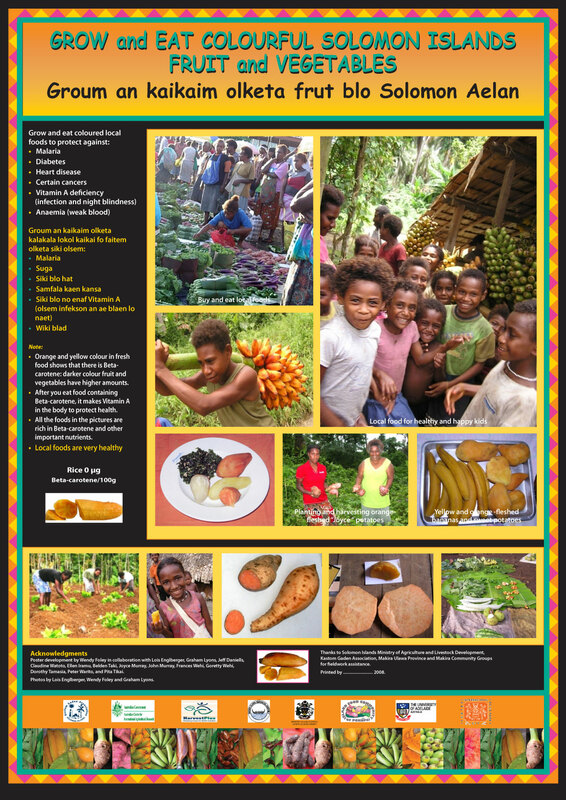 Kastom Gaden Association has launched two poster to promote traditional varieties of bananas and sweet potato with orange coloured flesh which are high in vitamin A. 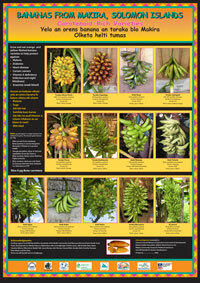 The promotion of these varieties is part of a long term strategy of Kastom Gaden to promote on farm conservation of agriculture bio diversity for its benefits for food security, nutrition and sustainable agriculture. Thanks to the Solomon Islands Ministry of Agriculture and Livestock Development, Kastom Gaden Association, Makira Ulawa Province and Makira Community Groups for fieldwork assistance. Poster development by Wendy Foley in collaboration with Lois Englberger, Graham Lyons, Jeff Daniells, Claudine Watoto, Ellen Iramu, Belden Taki, Joyce Murray, John Murray, Frances Wehi, Goretty Wehi, Dorothy Tamasia, Peter Warito and Pita Tikai. Photos by Loise Englberger, Wendy Foley and Graham Lyons. 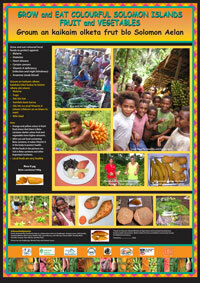 Project funded by ACIAR/Harvest Plus, Secretariat of the Pacific Communities Land Resource Division/Prench Pacific Fund. Poster development by Wendy Foley in collaboration with Loise Englberger, Graham Lyons, Jeff Daniells, Mary Taylor, Claudine Watoto, Ellen Iramu, Belden Taki, Joyce Murray, John Murray, Frances Wehi, Goretty Wehi, Dorothy Tamasia, Peter Warito and Pita Tikai. Photos by Jeff Daniells and Loise Englberger.